22. März 2012 · von Jakob B.
Das ist ja eine richtige Commons-Hymne, oder? Der 1912 geborene Musiker, der schwer an Chorea Huntington erkrankt war, verstarb bereits im Alter von 55 Jahren in New York. Diese Interpretation durch seinen Sohn Arlo ist auch komisch berührend, finde ich. Hier noch ein cooles Teamwork und schließlich zum Amtsantritt von Barack Obama. Dieser Beitrag wurde unter Personen abgelegt und mit Arlos Guthrie, Woody Guthrie verschlagwortet. Setze ein Lesezeichen auf den Permalink. Not (a commons song) if you ask the native people of the Americas…….. Please elaborate this point a little further. I think it is a very important perspective. The indigenous people were expelled from their land – so it was only the land „for“ the white. Die Frage für die Zukunft ist aber, ob es eine Perspektive, die das Land wieder als „yours AND mine“ denken kann. Guthry hat das sicher auch nicht anders gesehen. Just for not being misunderstood: I of course got j4ymp’s point, but wanted to encourage further elaboration, because the matter deserves more than a single phrase. Beside that, however, I understand Guthrie’s lyrics in a different way. The song in fact addresses „enclosure“ in front of dramatic social scenarios that affected native Americans and people with a migration background likewise. A complex matter … . Of course he needed the money, of course it made sense for him to do, but it also appears that he shared a part of that industrial vision. None of this to say that he was a bad person, as already noted, but merely to warn of gooey-eyed romanticism on the basis of a progressive position on copyright and great lyrics and actions. There is little to suggest that Guthrie had a spiritual connection to the land – the kind of connection that was/is typical of native people and their relations with the land (Mother Earth) and the environment – rather, it is arguably more feasible to suggest that he had a productivist vision of the world, in which roads and dams and cars served the little man and woman by providing him and her freedom. But while those developments might have served the little people and the environment, they certainly also did serve the Rockefellers and the Bushes very well. In this light, I don’t think that – generally speaking, and also tendentially, for agument’s sake, romanticising and ascribing a homogenous, simplified vision to „native“ people – Woody’s vision of the land was particularly much in harmony with the original inhabitants of the continent that he helped pave and dam and supported in war. All that said: What a fantastic set of songs and without Woody, no Bob Dylan and without Dylan, well.. (But there is another complex issue: despite all of Dylan’s (to many) amazing, enlightening, poetic, liberating lyrical moments, he is probably not a saint either and also an American Dreamer who supports Cadillacs, Harley-Davidsons and the open roads and who hid away in a mansion owned by the Ford family when the protest/60s movement wanted a piece of him – and you can hardly blame him!). I hope that sheds a little light on the comment, which was merely meant to provoke a little reflection, and it seems it has. 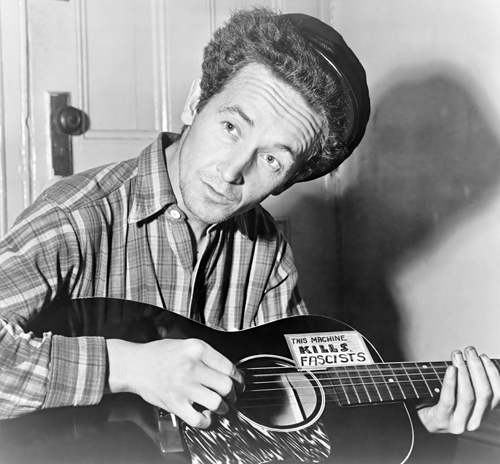 Peace by upon Woody Guthrie! That’s what I love about blogging, when a small thought decorated with a youtube link transforms into an interessting discussion to reveal things that you never considered before. Peter Linebaugh hat es in seinem Buch The Magna Carta Manifesto ein bisschen umgedichtet – „this land was made BY you and me“ – dann stimmt es auch, oder sogar mehr, für die Indigene Bevölkerung. Der Song ist ja allerdings sehr amerikanisch. Bzw. er besingt die schöne nordamerikanische Natur, um darüber zu der Eigentums-Frage zu kommen. Daher kann man ihn hierzulande natürlich schlecht singen. Auch ein einfaches Übersetzen ins Deutsche ist nicht unproblematisch. Denn selbst wenn man damit auf die Frage nach Grundeigentum hinleiten will, so sind doch patriotische Gefühle hierzulande so verpönt, dass der Song so nicht funktioniert. Das hast Du geklaut! Gib’s zu! Kündigung deiner Wohnung? Wegen des Textes oder wegen der Harmonien?